CTG —which stands for coal-to-gas— technology encompasses expossing coal to controlled amounts of heat and limiting the oxygen so it breaks apart chemically rather than burning. 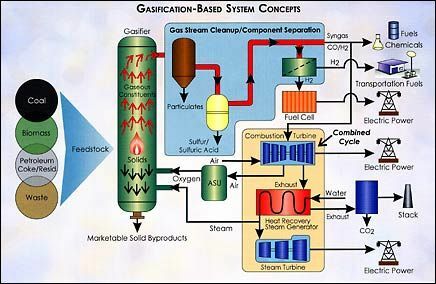 The outcome of this process is syngas —short for synthetic natural gas—, which would reduce the air pollution generated by power plants accross the country. However, there's a catch in China's attempt to clear their black skies: coal-to-gas plants require more water and release more carbon dioxide into the atmosphere than coal burning does. On the long run, implementation of CTG technology would increase China's greenhouse gas emissions between 36 an 82%, which would have disastrous consequences for the environment. China's biggest cities are choking on smog and air pollution emitted by nearby coal plants, and residents are fed up. One way to fix this is to switch over to cleaner energy sources (solar, wind, nuclear, or even natural gas), which has the added benefit of cutting carbon-dioxide output from the world's largest emitter. But not always! In fact, one of China's big proposals for cleaning up air pollution could, paradoxically, make climate change even worse. Reuters reports that China has just approved three new plants in its western provinces that would turn coal into synthetic natural gas. The idea is that this gas would then be shipped to population centers in the east, where it would burn much more cleanly in power plants and detoxify the air in cities like Beijing. Except there's a huge catch: The coal-to-gas (CTG) plants themselves are highly energy-intensive and can create far more CO2 overall than coal alone. It's basically swapping less smog for more climate change. China currently has three CTG plants operating, four under construction, three newly approved, and plans for another 17 in preparation. If even a fraction are built — a big "if" — that could have a sizeable impact on global warming. One drawback is that it's rather expensive to do so. During the oil crisis of the 1970s, the Department of Energy heavily subsidized various CTG technologies in the United States. But only one large plant ever got built in North Dakota before the concept was largely abandoned. Yet China only produces about 190 bcm of natural gas domestically, gas imports are expensive, and its domestic gas deposits are difficult to tap (more on that below). Meanwhile, the country has vast coal reserves and a lot of coal miners who could be out of work if coal consumption dips too far. So coal-to-gas seems like a nifty way of squaring this circle. The proposed CTG plants would be located in the coal regions of inner Mongolia, Shanxi, and Xinjiang, far away from major population centers. The gas would then be piped to cities — where it would replace coal and significantly cut local air pollutants like sulfur dioxide and soot. The danger here is that CTG plants are extremely energy-intensive, and they can be even worse for global warming than coal alone. They're also much worse than using natural gas that's drilled out of the ground. 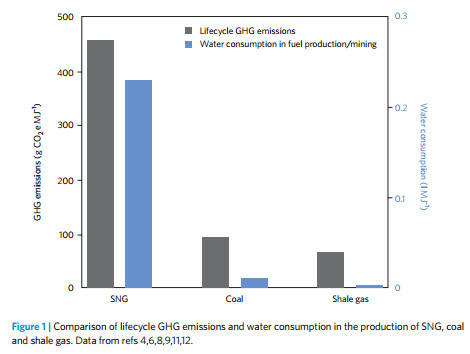 In a 2013 analysis for Nature Climate Change, Chi-Jen Yang and Robert B. Jackson of Duke University estimated that making synthetic natural gas (SNG) from coal in China and using it for electricity would lead to 36 percent to 82 percent more greenhouse-gas emissions per unit of energy than simply burning coal. Creating liquid transportation fuels from coal, meanwhile, could be twice as CO2-intensive as using gasoline. It's possible that CTG plants could eventually try to capture and sequester the carbon dioxide they produce, but that technology is still in its infancy. For the time being, CTG is likely to produce lots and lots of CO2. Yang and Jackson looked at nine CTG plants that were then under consideration by China. If all came online, they would produce 21 billion tons of carbon dioxide over 40 years just by themselves. (To put that in perspective, the entire nation of China produced 8.5 billion tons of carbon dioxide in 2015.) "Under such a scenario," the authors wrote, "China will inevitably struggle to reduce its future GHG emissions." How many CTG plants will China actually build? Now, the big asterisk here is that China might not end up building many more CTG plants beyond the three already operating. The country has dithered over these plants for years, and the economics are brutal. "The market is not on the side of CTG producers, and the projects remain costly," Liu Guangbin, a gas analyst, told Reuters. It's also worth noting that CTG isn't the only option China has to increase gas supplies. The country also has massive reserves of natural gas locked in shale rock across the country, though it's had trouble accessing them. The country originally planned to produce 60-100 bcm of shale gas by 2020. More recently, it has cut that target to just 30 bcm. China's energy companies are still struggling to make use of the same fracking techniques that have worked in the United States. A report last year from Zhongmin Wang of the Paulson Institute examined some of the challenges here. Unlike in the US, oil and gas companies can't just buy up mineral rights from private individuals, so the incentives to drill don't always line up well. Scarce water and the rather unique geology of China's shale have also posed a challenge for drilling projects. The benefits could be considerable, though. As the graph above from Yang and Jackson shows, fracking for shale gas in China would produce far fewer carbon dioxide emissions than either coal mining or those new CTG plants. Yet if fracking develops too slowly (or not at all), and clean sources like nuclear or renewables aren't sufficient to displace coal, then China may turn to CTG. And once those plants are built, they're almost certain to operate for decades. This will be a story to keep an eye on in the years to come.